From blazing a trail, to taming motorway miles, to cutting across town, the Triumph Tiger Explorer’s powerful inline triple engine, long travel suspension and rugged off-road looks comfortably conquer the toughest terrain, the biggest distances and the bumpiest back roads the world has to offer. The Tiger Explorer is the premier off-road bike that will never let you down. The Triumph Tiger Explorer rides new routes across new countries, but doesn’t have to stop when the road runs out. Ruggedly dependable with a powerful, torque-rich engine, extended fuel range, agile handling and practicalities such as a centrestand on all models, the Tiger Explorer also features ABS, traction control and cruise control as standard. And for even more capability on unmade tracks, the Tiger Explorer XC includes wire-spoked wheels, aluminium sump guard, engine protection bars, fog lights and hand guards. The Triumph Tiger Explorer’s traction control adds confidence in treacherous conditions by maintaining wheel-slip at a manageable level giving you the ultimate comfort and feel. Cruise control is also fitted as standard, easing fatigue over distance and optimising fuel efficiency. The Triumph Tiger Explorer’s sophisticated switchable anti-lock brake system is standard, and can be optimised for off-road use, or turned off entirely. Unnoticeable in normal riding conditions, the ABS modulator works behind the scenes making over 100 calculations per second to make sure it’s there when you need it. In case your Triumph Tiger Explorer attracts the wrong kind of attention, we’ve added a coded key immobiliser system. It disables the ignition and starting if an attempt is made to turn or force the ignition switch without the presence of the correct, electronically coded, key. The Tiger Explorer’s LCD dash and bar-mounted switches make it easy to navigate dual trips, journey time, average speed and fuel consumption, remaining tank range, cruise control info, service intervals, ambient temperature and ice warning, plus tyre pressures and heated seat status (if fitted). The Triumph Tiger Explorer’s commanding riding position suits everyone. A wide, comfy seat is easily adjusted without tools from high (857mm) to low (837mm), or even further with an accessory low seat – so you’re always confident and in control. Handlebars and levers also adjust for fine-tuned ergonomics. Whatever the weather, the Triumph Tiger Explorer’s class-leading 950W alternator has ample strength to power multiple accessories such as spotlights, heated grips and/or heated seats, as well as using the 12v socket to run a GPS unit, heated clothing, or even charge a phone. With a potent 1215cc inline three-cylinder engine pumping out a colossal 121Nm of torque and 137PS peak power, the Triumph Tiger Explorer delivers smooth, effortless, efficient high speed cruising at low revs. But with linear, ride-by-wire throttle control and a comprehensive set of electronic systems and riders aids, the Triumph Tiger Explorer is also responsive and free-revving enough to deal with the finesse of riding off-road. 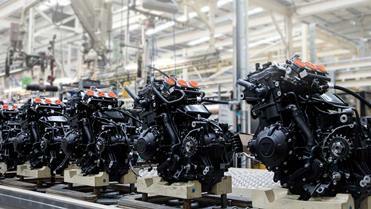 For worry-free long-distance touring, the Triumph Tiger Explorer features a low-maintenance shaft final drive system. It means peace of mind no matter how far your adventure takes you. For maximum control over engine response and fuel consumption, the Triumph Tiger Explorer features a ride-by-wire throttle system that uses electronic engine management to harness and exploit the engine’s prolific torque output in the most efficient, predictable way. The Triumph Tiger Explorer’s double overhead cams and four valves per cylinder layout enable the engine to deliver consistent and efficient performance under any conditions, from a solo motorway ride to a mountain climb loaded with rider, passenger and a full complement of luggage. Modern roads sometimes feel like a bumpy trail, so the Triumph Tiger Explorer’s tough, tubular steel frame layout is specially strengthened to remain secure and controlled while riding off-road or on poorly maintained back roads, as well as meeting the demands of fully-loaded touring at high speed. That’s why the Triumph Tiger Explorer feels just as at home in town as it does on the tundra. For the ultimate in off road capability and confidence, the Triumph Tiger Explorer XC model comes on wire-spoke wheels with aluminium rims. Lightweight and highly resilient, the tubeless 17in rear and 19in front improves steering response and adds to off-road agility. With a road-oriented bias, the standard Triumph Tiger Explorer runs on lightweight, 10-spoke, cast aluminium wheels. With a 17in rear and 19in front, the set-up is capable of light off-road riding as well as conventional road riding, and deals effectively with poor road surfaces or rutted paths. Braking on the Triumph Tiger Explorer is handled by a pair of 4-piston calipers gripping twin 305mm discs at the front, backed up by a single 282mm rear disc. The powerful stopping force is assisted by an advanced ABS, but which can be disabled completely when riding off-road. The spirit of adventure lives inside all Triumph Motorcycles. 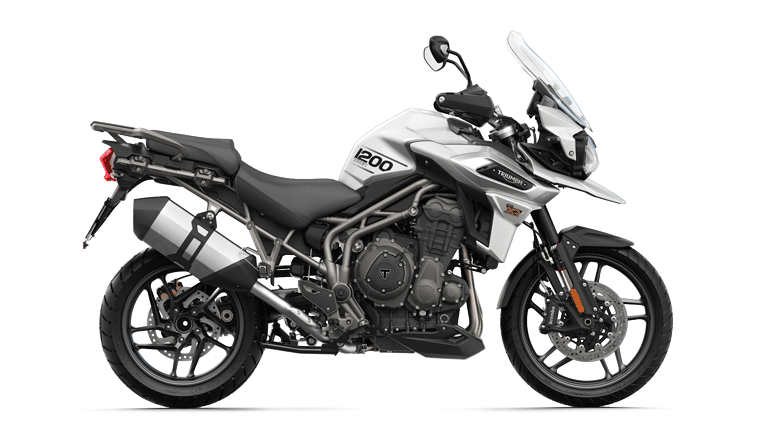 But with the Triumph Tiger Explorer it’s obvious on the outside too, with off road-style suspension for comfort and control, a spacious riding position, distinctive single-sided shaft-drive swingarm and a host of go-anywhere practical touches. The Triumph Tiger Explorer XC adds these extras for more off-road versatility: Wire-spoked wheels on aluminium rims for improved off-road capability, hand guards protect from debris on and off road, and add wind protection in cold conditions, dual 55w LED fog lights increase visibility in poor riding conditions, an aluminium sump plate adds extra off road protection and black engine bars protect the engine and frame in a spill. Triumph hard panniers with 62-litre capacity, ‘one key’ locks, branded brushed aluminium covers and weather-proof construction for the ultimate adventure touring. Floating mount assembly ensures performance isn’t compromised, even fully loaded (fits a full face helmet in left pannier). Triumph 35-litre capacity top box, ‘one key’ lock, branded brushed aluminium cover and weather-proof construction. Designed to hold a full face helmet, with a 10kg weight limit. Also features an internal 12v socket to charge electrical items. Thermostatically controlled heated rider and/or pillion seats are a must for comfortable all-season riding, and feature switchable temperature settings and high quality electrical elements for efficient, comfortable heating. Increase your visibility and safety with a high performance twin fog lamp kit, featuring 55w high power LEDs, drilled and brushed marine-grade aluminium shields, an integrated tubular mounting rail and fully waterproof illuminated push button for ease of use in the worst of conditions. An adjustable high-level touring screen, 50mm higher and 30mm wider than stock, adds extra protection from the elements. Made from injection-moulded polycarbonate, the Quantum coated surface offers the ultimate in high impact and scratch resistance, plus better optical definition. Designed specifically for the Triumph Tiger Explorer’s ride-by-wire throttle, a pair of factory-finished heated grips are internally wired for neatness, and feature dual temperature settings selectable via a bar-mounted two-colour push button control.